I just finished reading 'Start With Why ' by Simon Sinek and thought I would just summarise the main idea presented in the book which is called The Golden Circle. The Golden Circle is an idea that states that there are three levels of concept behind a company. WHAT describes what the company actually does (making a product). HOW describes how the company does it (their USP). WHY describes the companies greater vision (the reason behind what they do and how they do it). In his book Simon Sinek states that his research has found that most companies can easily articulate WHAT they do and HOW they do it but often struggle to communicate the reason that they do it - their WHY. He also states that what makes companies like Apple Inc. different is that they not only understand their WHY but they lead with it in all that they do. From their decisions in product design to their marketing, it is clear that Apple is out to challenge the status quo. This action of leading with their WHY makes Apple stand out because so many other companies do things the other way around. They lead with WHAT they do and use their HOW to persuade people to buy their product. Leading with your WHY first makes a connection with the customer. If they relate to and believe in your WHY they are much more likely to buy your products, even if your WHAT and HOW is not quite as good as your competitor's. Take the iPhone for example. The iPhone is a magnificent piece of engineering but when compared to it's competitors, if you were to judge devices based solely on their cost and feature-set the iPhone would not come out on top. So why then does Apple sell so many iPhones? It's because the people that believe in their WHY would prefer to buy from Apple, a company that has values and clear, visible ambitions, rather than a company that they might not no so well. The best bit is that the customer doesn't always know that this is why they are choosing to buy from one company over another. It's to do with how the brain works. The part of your brain that is responsible for your 'gut feeling' is not responsible for communication and therefore if you were to ask someone who has acted on an inner feeling why they purchased a certain device they might not be able to accurately tell you. They may say something like 'it was cheaper' or 'it looked nicer'. It's kind of like when someone asks you why you love your girlfriend or wife, you know you do but it is hard to put the feeling into words. 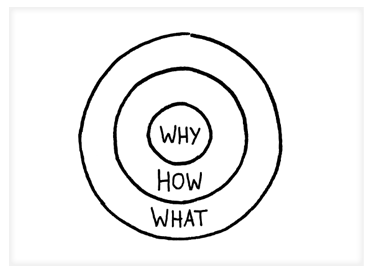 In this post I just wanted to give you a brief overview of the concept of the golden circle but I would definitely recommend reading Start With Why: How Great Leaders Inspire Everyone To Take Action . It could just change the way that you approach decision making for ever. I know that it has had a big impact on me. I will leave you with a quote for the book.